It’s May 28th. 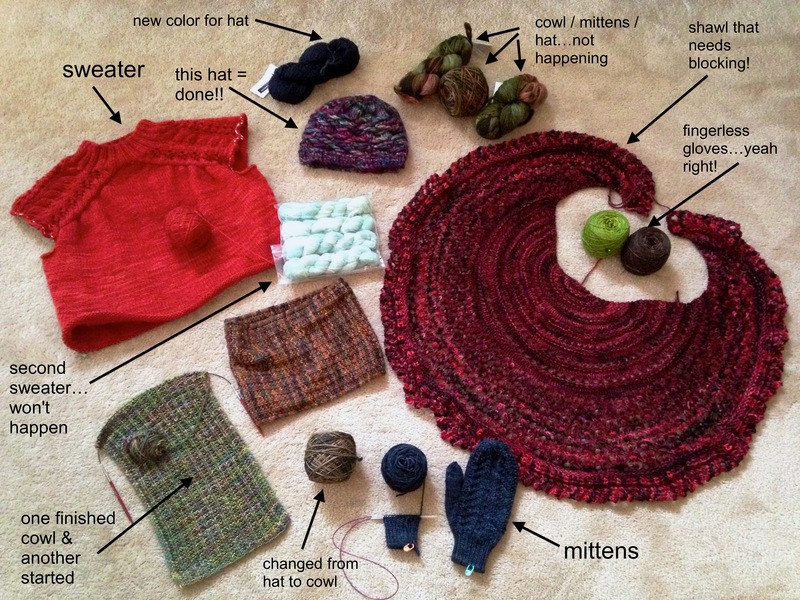 And I still have projects, and no recent blog posts, about Malabrigo March. Yes, MARCH. Where does that mysterious thing called “time” go? …I think I am knitting in a Malabrigo-induced stupor. Real Life has actually just been busy with grad school, work, and other things such as knitting and beautiful spring weather. Because of all of the above, this blog has been a little sparse! 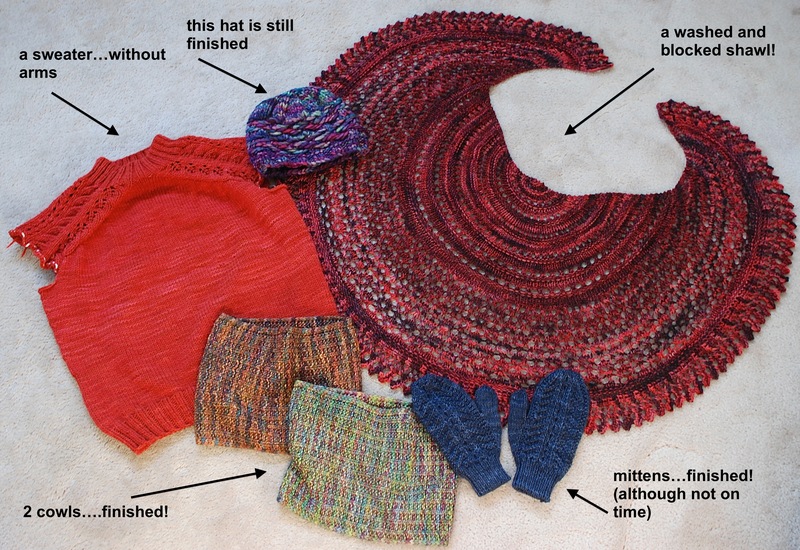 But, I thought I should give you an update on my original Mal March projects (find blog post 1 here and blog post 2 here) so I can move past those and blog about other knitting news! I finished two projects in my last post, and since then, I have finished the shawl, second cowl, and pair of mittens. Sarcastic comments added at no extra charge. Is it weird if I want to roll around in this pile of knit Malabrigo yarn? Of course, March has already passed, so me finishing any more of these projects doesn’t count for any special prize, except that I am getting closer to finishing what I started! Let’s start with the most striking project, or so I think. I actually did finish this on March 27, but didn’t get photos in time for my last blog post. Oh, well; all of that mental sweat was worth it! Actually, it was quite crazy to see just how much it grew before and after blocking. Yes, dear readers, that is the same yard stick (36″) in both photos. Notice a difference in the shawl’s size…? I am doing my best to project a “Little House on the Prairie” feeling in this shot, with the shawl-over-the-shoulders style. If you are interested, check out my Mal Hug on Ravelry for more photos and detailed notes about my project! I used leftover yarn from my Malabrigo Stockpile sweater I knit last October; it equaled exactly one skein of Rios. Check out my project notes here on Ravelry for my Mal Cowl, take 2! And finally, I finished the pair of mittens. While these mittens and the above cowl did not make the March deadline, it was still satisfying to finish them fairly quick! Trestlewood Mittens by Heidi A.
I used Malabrigo Worsted in the color Garden Gate. These are a fantastic match with my new hot pink winter coat! It’s always good to finish mittens in May, when it’s nice and warm out. NOT. Here’s my project page for my Trestlewood Mittens, if you are interested in seeing my slight modifications! Overall, I’d say it was a successful first Mal March. I may or may not be plotting already for next year! If you’d like more day-by-day updates, rather than once or twice a month updates, check out my profiles below on Facebook, Instagram, or Ravelry! Beautiful shawl! I love the Malabrigo, too! Thank you!! 🙂 It is such nice yarn.